We reblog an article from March 7, 2015 about racism in France. We do not agree on everything in the article, but still think its an important article to understand a part of the context of the ongoing clashes in France. We don’t agree on using terms like “The French” or “French people”, we believe there is no such thing as “The French or “The Americans”. 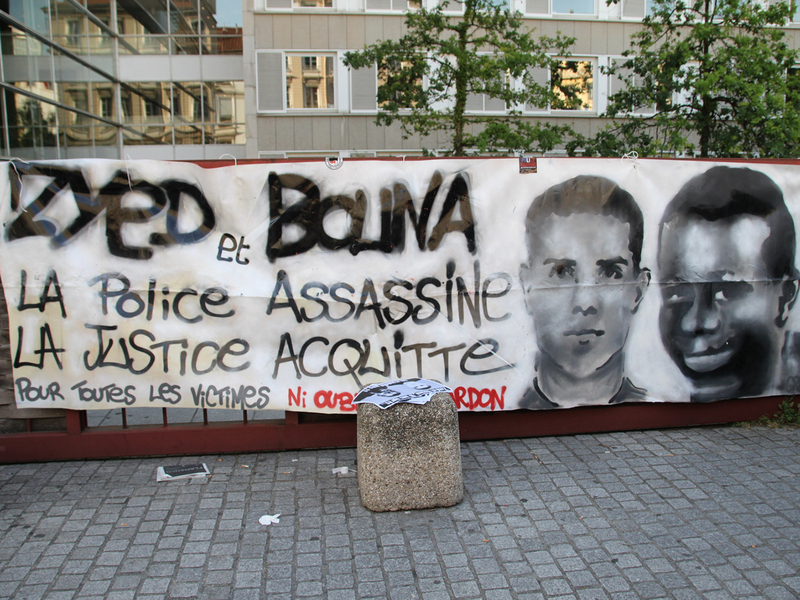 Image: Zyed Benna and Bouna Traoré, two teenagers who died on October 27th in 2005 after being chased by police officers. Yet, despite these transformations, the French government seems to have almost entirely abdicated its responsibility for dealing with racism. In terms of policy, French “anti-racism” is a total disaster. Instead of formulating anti-racist policies and collecting anti-discrimination statistics, the country contents itself with anti-racist discourse and magical thinking. In 2011, the U.N. issued a report condemning France for its “racist climate” and lack of “real political will” to address racial discrimination. In 2013, French politicians took steps to remove the word “race” from its laws , apparently guided by the magical belief that changing words is enough to fight racism. The more time I spend in France, the more it seems to me that some French people (especially politicians) are extraordinarily skilled at talking about principles that they have no intention of doing anything about. Perhaps the French (We don’t agree on using terms like “The French” or “French people”, we believe there is no such thing as “The French or “The Americans, editor Enough is Enough) are stuck because they are far too philosophical and not at all practical when it comes to anti-discrimination. I don’t doubt the sincerity of most anti-racist groups that oppose policies that would actually expose and address racism. I have not always had the policy positions I have now. Certainly when I started my research in France, I did not have strong opinions. While I always saw myself as anti-racist, I was not informed enough to have a clear sense of whether ethnoracial statistics or “American-style” policies were needed in France. But after spending nearly three years living in France and interviewing over 100 French activists and ordinary people, my views began to change. It became increasingly obvious that the French population is mired in ignorance about the social and historical reality of race. Even moreso than in the United States, French discourse “about race” is incredibly superficial, asociological and ahistorical. Of course they don’t know how to fight racism. #JusticePourTheo Statement: Solidarity with #Théo & every victim of police abuse! No to the “Public Security” law! | Enough is Enough! #JusticePourTheo #PasdeJusticePasDePaix 13 Nights of Revolt in #France & No End Insight | Enough is Enough! #JusticePourTheo #BlocusPourTheo Cops Attacked Student Protest Against Police Violence | Enough is Enough!